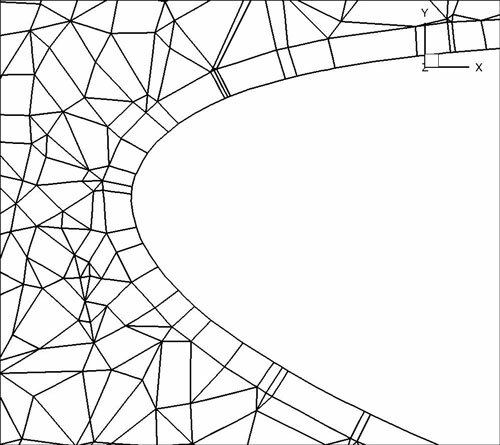 NekMesh is designed to provide a pipeline approach to mesh generation. To do this, we break up tasks into three different types. Each task is called a module and a chain of modules specifies the pipeline. Figure 4.2: Illustrative pipeline of the NekMesh process. In the rest of these subsections, we discuss the various processing modules available within NekMesh. Where high-order information is not available (e.g. when using meshes from imaging software), various techniques can be used to apply a smoothing to the high-order element. In NekMesh we use spherigons, a kind of patch used in the computer graphics community used for efficiently smoothing polygon surfaces. Spherigons work through the use of surface normals, where in this sense ‘surface’ refers to the underlying geometry. If we have either the exact or approximate surface normal at each given vertex, spherigon patches approximate the edges connecting two vertices by arcs of a circle. In NekMesh we can either approximate the surface normals from the linear elements which connect to each vertex (this is done by default), or supply a file which gives the surface normals. Often it is the case that one can generate a coarse boundary layer grid of a mesh. NekMesh has a method for splitting prismatic and hexahedral elements into finer elements based on the work presented in  and . You must have a prismatic mesh that is O-type – that is, you can modify the boundary layer without modifying the rest of the mesh. in the standard segment [-1,1]. These are then projected into the coarse elements to construct a sequence of increasingly refined elements, as depicted in figure 4.4. Figure 4.4: Splitting Ωst and applying the mapping χe to obtain a high-order layer of prisms from the macro-element. Figure 4.5: (a) LE with Spherigons but only one prism layer for resolving the boundary layer, (b) LE with Spherigons with 3 growing layers of prisms for better resolving the boundary layer. Often one wants to visualise a particular surface of a 3D mesh. NekMesh supports extraction of two-dimensional surfaces which can be converted using XmlToVtk or similar programs for visualisation purposes, or combined with FieldConvert in order to extract the value of a 3D field on a given surface. An optional arguemnt of detectbnd can be added to identify the boundary composites as part of the surface extraction. The ability to remove all the high-order information in a mesh can be useful at times. 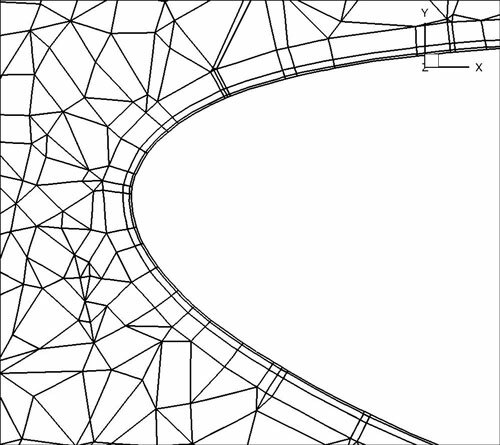 The output will contain only the linear mesh information, all curved information is removed. When the mesh is three-dimensional and comprised of a prismatic boundary layer with tetrahedra in the interior of the domain, this module extracts the prismatic elements only, and constructs a boundary region for the interface between the tetrahedra and prisms. This is useful in, for example, the study of aortic flows, where the prismatic boundary layer can be extracted and refined to study unsteady advection-diffusion problems on a more refined grid inside the boundary layer. There are no configuration options for this module, as it is highly specific to a certain class of meshes.